Een slaapkamer appartement gelijkvloers eenheid direct aan het strand. Dit appartement is gelegen tussen de kust en rozemarijn gelegen op ongeveer 15 mijl van Panama City Beach. Dit is een rustig familie strand en zeer privé. Wij hebben alle gemakken van thuis en verwelkomen u om in onze plaats te blijven en geniet van dit prachtige strand appartement. Onze achterportaal loopt rechtop naar het strand. Er is een mooi King size bed in de slaapkamer met stapelbedden voor volwassenen of kinderen. We hebben een slaapbank met 2 slaapbanken. Dit is een zeer luxe gebied en gezinsgeoriënteerd. Dit is een geweldige plek voor een familievakantie of een koppelvakantie. Plan je meiden weekend uit. Als u fietsen, breng dan uw fietsen of huur ze lokaal. Er zijn veel fietspaden en een fietsvriendelijke omgeving met fietsrekers beschikbaar op het terrein. Boek nu en begin met het plannen van uw vakantie. Uitstekende locatie op slechts 15 minuten rijden naar Pier Park in Panama City. Dit strand is niet druk met veel privacy! We zijn ingedeeld als Seacrest / Seagrove strand en verkozen tot de # 1 strand op 30 A voor de privacy. We zijn 1. 7 mijl van Rosemary Beach en 5 mijl van Seaside. Er zijn zo veel leuke restaurants en winkels in de buurt en veel activiteiten voor het hele gezin. Het is zo leuk om uit te gaan en te genieten van alle activiteiten langs 30A en om de familie naar Pier Park, maar kom dan terug naar een mooie rustige wandeling op onze afgelegen strand! Het is de hemel op aarde! My husband and I celebrated our 25th anniversary in Seacrest at the Maynards' Seacrest condo and had an amazing experience. 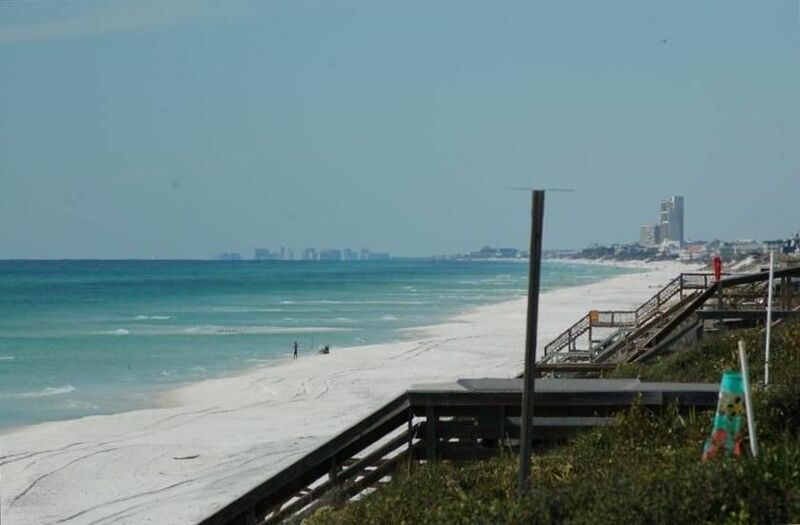 We loved the ground floor walkout to the private beach, and being in a smaller community setting away from the congestion of PCB. The condo provided all the necessary amenities and our stay was comfortable and peaceful. I'm looking forward to returning to the Seamist condos for another peaceful retreat. We loved everything about to condo and the location. I could throw a rock in the ocean from the back porch! Great eating locations and it’s only 15 mins from pier park! We would definitely comeback. It was only one issue and that was the WiFi at the condo wasn’t working. They have the password on the fridge but we think someone had to change it because we tried everything to get it to work. Also you should put which network to connect too because there were several networks. Other than that we had a great stay! Thank you and I am glad you all enjoyed our place. We got to the problem of the wifi. Thank you for sharing. Great first stay on 30A! We enjoyed staying here. It was very conveniently located to local restaurants and shopping and right off the beach (there are lots of stairs to get down to the beach but for anyone who is able to walk stairs- it’s not a problem). The condo was comfortable, clean, and had what we needed- we liked having access to a full size fridge! Our family's new "home away from home" on the beach! We LOVED every minute of our stay in this beach front condo! It was just amazing! Everything was very clean and well-kept when we arrived. The kitchen was stocked with all the dishes and cooking supplies we needed. It was really nice to have a few extra necessary items stocked to hold us over until we could get to the store (i.e., toilet paper, paper towels, trash bags, dish soap, laundry detergent, hand soap). The king size bed in the bedroom was one of the most comfortable beds we have slept on!! Our kids loved the bunk beds in the hallway too. The ocean view was just breathtaking! And one of our favorite parts was the easy access to the UNCROWDED beach!!!! It rained and stormed for 2 days during our stay, but we were able to find other entertainment nearby since Panama City Beach was just a short drive away. This was by far our favorite beach vacation yet, thanks in large part to this amazing beach front condo! We have already booked our beach vacation for next year! Can't wait to go back! The house is in a good location with a nice beach that isn't crowded. This home had great updates and ample supplies for the kitchen, i.e., 5-6 cutting boards, plenty of pots and pans, dishes, glasses, knives, towels, storage space, etc.. Having said that - the private porch on a corner and the view was spectacular! We will definitely be coming back! Fietspaden waarmee beveiligde toegang tot alle gebieden in beide richtingen OP 30-A. Veilige fietsraces zijn op beide einden van het gebouw gelegen. JE MOET EIGEN LOKAAT VOORZIEN. TOEGANG TOT STRAND IS BEPERK EN GEWASSEN IS NOOIT EEN UITGAWE. Wij vragen dat wanneer u het strand afzet dat u alleen voetprints in het zand laat verlaten. PLAATSELIJKE VENDOREN WORDEN VERKOCHT OP KOELER ALS U WILT VERZOEKEN, UMBRELLEN, BIKEN, ETC. Wij hebben altijd een aanbod van strandleergoed voor de kinderen die in een totalisator op de achterkant liggen. AGAIN, DIT IS HET ONZE FAMILIE'S HUISHUIS EN IS ZEER GEBRUIKT VOOR FAMILIEVAKANTIES, ALS ROMANTISCHE GETAWAYS. WE PROUDLY OFFER DISCOUNTS FOR MILITARY, PUBLIC SAFETY(LAW ENFORCEMENT,FIRE,EMS) AND RETURNING GUESTS.